Elephant ears, also known as taro or by their scientific name, Colocasia esculenta, grow natively in swamps and wetlands in tropical areas of Asia. In the United States, gardeners often treat elephant ears as annuals by overwintering the tubers indoors. Hardy in zones 8 through 11, the plants prefer warm or tropical climates and cannot tolerate cold winters. Growers value elephant ears for their striking, heart-shaped leaves that resemble the ears of elephants. Numerous cultivars exists, some producing variegated, purple and almost black foliage, although light to dark green is most common. Plant elephant ears during spring in a location that receives partial shade throughout the day. Apply a 3-inch layer of organic compost to the planting site and use a garden tiller to incorporate into the soil before planting. Space elephant ear tubers 2 to 3 feet apart. 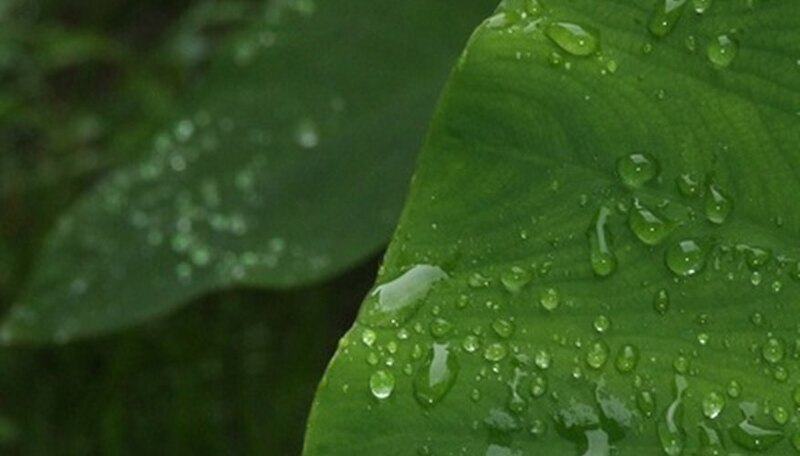 Water elephant ears once every five days during the first three months of growth to help them become established. Reduce watering thereafter to once every 10 days. Increase watering to once or twice per week during periods of drought or extreme heat. Feed elephant ears during early spring with a slow-release fertilizer to gradually distribute nutrients into the soil throughout the growing season. Apply at the manufacturer's recommended rate, and then water thoroughly for the best results. Spread a 2-inch layer of mulch over the soil surrounding elephant ears during fall, just before the first frost of the season, to protect the plants from cold damage. Remove the mulch during early spring before active growth resumes. Prune away faded and damaged leaves during midsummer. Remove the foliage at its point of origin to reduce the chance of disease and avoid damaging the plant. Cut back elephant ears to the ground after the first frost of fall. Dig up elephant ear tubers before the first killing frost in USDA hardiness zones 1 through 7. Store them in peat moss at a temperature of around 55 degrees Fahrenheit until spring. Replant outdoors after all danger of frost has passed. Allow the tubers to remain in the ground in zones 8 through 11 and new growth will appear in spring. Grow elephant ears in full sun if desired, but water the plants twice per week to keep up with their high moisture requirements. Use a heavy mulch, such as wood chips or evergreen boughs.